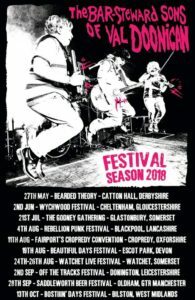 If you’ve seen my recent post about Fairport’s Cropredy Convention you’ll have seen one of the bands I’m really looking forward to seeing is The Bar Steward Sons of Val Doonican. Hailing from Barnsley, Yorkshire, this three piece band featuring Scott Doonican (vocals, geetar, banjulele, synthesiser uke, kazoo), Bjorn Doonicanson (tenor banjo, fiddle, mandolin, flat-pack furniture) and Alan Doonican (piano accordian, keyboards, ukelele, master storyteller), play parody songs of hilarious genius such as The Lady in Greggs, Massage in a Brothel and Since You’ve Been Ron. ‘Determined to follow in their spiritual father’s immortal footsteps’ the three estranged brothers perform hilarious shows all the while immaculately coiffered and dressed in their finest knitted tank tops. And if you can make your way to any of the above festivals make sure you do, you will not be disappointed by their raucous, fun filled and hilarious performances. Be prepared to be rocked…gently!